Current understanding of genome structure, composition and activity is undergoing rapid and revolutionary changes as a result of new methods for genome screening, sequencing and analysis. The employment of techniques such as tiling arrays and the increasing adoption of 2nd generation (non-Sanger method) DNA sequencers has accelerated this process. New discoveries have also emerged and changed perceptions of established facts such as previously accepted views that most of the genome is junk. For example, new findings that are attributable to unstranslated RNAs and microRNAs being important in cellular regulatory functions have prompted re-sequencing and re-analysing of established genomes. Biological data quantity and complexity are also increasing exponentially. This has lead to the need for more revolutionary and efficient means of storing and analysing genetic data. Conventional flat file and relational database structures have become obsolete or impractical due to their limitations in scalability and performance. Synamatix uses a completely novel approach to construct databases based on a proprietary and patented approach, whereby patterns, relationships between patterns and their significance are maintained in a "SynaBASE". All patterns between 1 and x are stored leading to enhanced sensitivity and specificity. Each pattern is extended until it becomes unique. Redundant patterns from new data are not stored, resulting in improvements in database scalability. The end result is a “Structured Network Pattern Database” which offers 100s to 10,000s fold improvement in performance without reverting to incremental investments in hardware. Significant improvements in sensitivity are also observed due to the exhaustive nature of SynaBASE. 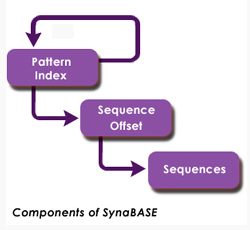 SynaBASE is the core technology underlying almost all Synamatix applications. A variety of approaches have been leveraged to enhance performance across a very wide array of genomic analyses. SynaBASE is a highly extensible platform. A large number of applications have been developed based upon internal research as well as in collaboration with some of the world’s leading genomics and bioinformatics researchers. Users are encouraged to develop their own applications on top of SynaBASE.